The next time replacing the batteries in an appliances leaves you with a couple spent ones in your palm, you might wonder, "what do I do with these now?" The answer isn't always straightforward. Read on to learn how to properly dispose of all the different types of batteries you might have in your home. Just think about how many different types of batteries exist. From non-mercury alkalines to lithium-ion rechargeables, there are more than enough options to complicate any seemingly simple trip to the convenience store or home center. Making things even more difficult is that for each type of battery, there’s a different recommended disposal method. Why? Because batteries contain metals and other chemicals that, improperly treated, can be hazardous to the environment. While some batteries can be tossed out with your regular trash, others require special care. For help determining how best to dispose of the batteries you’ve got, continue reading! In California, it’s illegal to toss any type of battery into the trash. In all other states, however, general-purpose batteries—that is, non-mercury alkaline batteries—can be included with your regular garbage. Most single-use (nonrechargeable), general-purpose alkaline batteries produced after 1996 contain no mercury; Duracell phased out mercury back in 1993. Note that for safety reasons, it’s best not to trash more than one battery at a time; if multiple batteries, each with a little juice left, come into contact with one another in a trash can, they might create a spark that ends up starting a fire. Recycling options for non-mercury alkaline batteries remain limited, though many local governments offer collection points. Check with yours to find out whether there are any such services in your area. If not, you can always rely on something like the iRecycle Kit from BatteryRecycling.com. The smallest kit, which enables you to mail in five pounds’ worth of batteries, costs $29.95. • Alkaline mercury batteries: Prior to 1996, alkaline batteries were manufactured with mercury. Though production has ceased, such batteries can still be found stashed in junk drawers. • Mercuric- and silver-oxide batteries: Often found inside things like watches and hearing aids, these “button cell” batteries contain high concentrations of heavy metals and acid-based components. Heavy metals are no trivial matter; leave their disposal to the pros. In many neighborhoods, regular collection is available at a specially designated facility. Contact your city or town hall for the details. 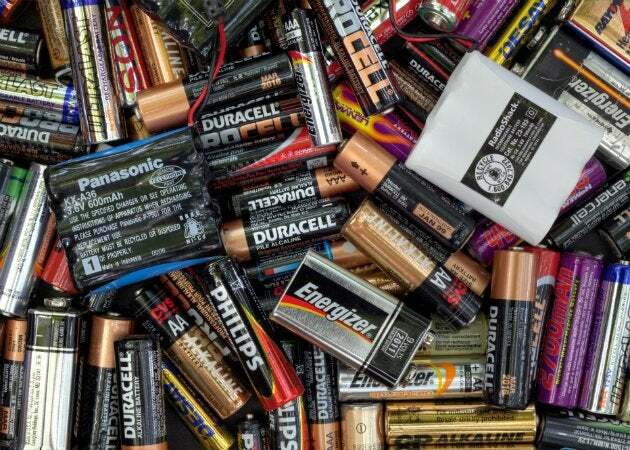 Used in everything from cordless power tools to digital cameras, rechargeable batteries have become fairly easy to recycle, thanks to a nonprofit organization. Call2Recycle has helped to bring more than 30,000 drop-off sites to North America. To find the site nearest you, simply call 1-877-2-RECYCLE or use the online locator. 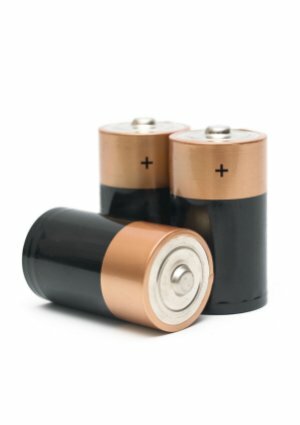 The following types of rechargeable batteries are accepted: nickel-cadmium (NiCd), lithium-ion (Li-ion, or LIB), small sealed lead acid (SSLA/Pb), nickel-metal hydride (NiMH), and nickel zinc (NiZn). Recycling not only safely controls heavy metals, but also puts many components back to work in the manufacture of new batteries. • Leave the battery packaging intact; do not break the battery open. Doing so constitutes a fire, health, and environmental risk. • Never burn batteries. When their chemical contents come into contact with fire, the batteries can explode, sending shrapnel flying. • Wrap dead, expired, or unused batteries in a nonconductive material (for example, packing tape) and keep them away from moisture.